The public art project “Dominion Is version 2.0” consisted of ten 3′ X 9′ photographic image text panels. The images were printed with a digital inkjet plotter and laminated in plastic. They were installed in five double-sided wood support structures mounted on the utility poles at 70 yard intervals along the west side of NW 83rd Street between NW 23rd Avenue and Santa Fe Terrace in Gainesville, Florida for a period of five weeks from October 4 to November 10, 1996. The images progressed with sequential zooms and the corresponding text read DOMINION… IS… GOVERNED… TERRITORY. “Dominion Is version 2.0” is the second installment of an ongoing public art project. I have adopted a version strategy to allow the project to expand from a local to a regional and ultimately national level. 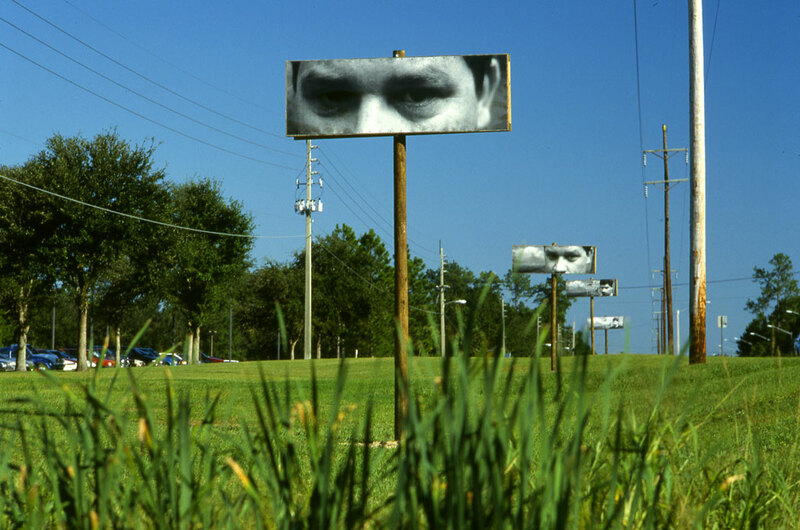 In the spring of 1995 I installed “Dominion Is” as part of the University of Florida’s annual faculty art exhibition. This project was made up of thirty image panels which were distributed in the wooded areas across the University of Florida campus. “Dominion Is version 2.0″was produced in conjunction with a gallery exhibition of the same title at Santa Fe Community College Gallery. This exhibition serves as a proposal for the regional expansion “Dominion Is version 3.0” which will span from Tampa Bay to Interstate 10 along the historic DeSoto Trail. The gallery exhibition consists of over fifty sequential images. 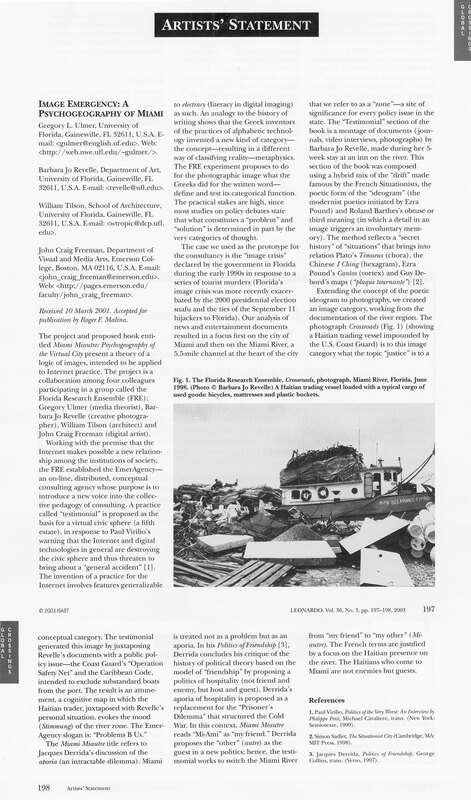 The short-term goal is to initiate a debate within the regional community about the role that artists play in our community and more broadly, to interject the environmental and social issues that surround Florida’s postnatural-postindustial environment into that debate. In the long-term, I hope to expand this work and the subsequent debate to a nationwide level possibly along interstate 10. The significance of this project is that it will be on the leading edge of a growing movement to redefine artistic activities. I share the belief of many contemporary artists that art being produced solely for a gallery or museum context is losing its relevancy. There are many problems associated with these traditional means of art dissemination including the commodification of culture and the perpetuation of an exclusive art arena which tends to alienate people outside of that arena. These problems can be circumvented by the development of new forms of public art. Recent technological developments make it possible to work with durable large scale photographic images in outdoor public spaces. My work is designed for an audience of ordinary people, not just an elite group of art world professionals and culture consumers. It is my intent to develop a living art form which will act as a catalyst for heighten social awareness about art, society and the environment.